Purism’s security-focused smartphone, the Librem 5, will come with support for Ubuntu Touch when it ships next year. According to the company, which made its mark building ultra-secure, open platform laptops, the operating system will be “well-supported and tightly integrated,” with future compatibility assured. AirPods have been around for a while, so many of us have gotten over the slightly weird look of them (with at least one notable exception). While Apple still has yet to expand the options beyond plain white, BlackPods has stepped in to fill a need. The company offers three-phase military-spec refinishing services for these buds, letting you transform the look with Stealth (matte black), Classic (high gloss black) and Aero (space gray). If you already have a set of AirPods, you can mail them in for refinishing, or simply buy a new pair through BlackPods directly. Since you’ll be walking around with these hanging out of your ears, this seems like an upgrade worth its salt, just like a nice pair of specs. This week, BlackPods has provided us with a set of Stealth and Classic models for two lucky readers. They even threw in a pair of silicon protective cases (again, in black) so you can go into stealth mode with a bit of added protection. Just head to the Rafflecopter widget below for up to five chances at winning a less glaringly obvious pair of AirPods courtesy of BlackPods. Contest is open to all residents of the 50 states, the District of Columbia and Canada (excluding Quebec), 18 or older! Sorry, we don’t make this rule (we hate excluding anyone), so direct your anger at our lawyers and contest laws if you have to be mad. Winners will be chosen randomly. Two (2) winners will each receive one (1) pair of Apple AirPods finished in either Matte Black or High Gloss Black by BlackPods ($299 / $279 value respectively) along with a Protective Silicone AirPods case for each one ($7 value). Entries can be submitted until April 25th at 11:59PM ET. Good luck! As rumored, Spotify today unveiled a redesigned app that’s geared toward users of its free music-streaming service at an event in New York City. The new mobile experience is all about personalized on-demand listening, with 15 playlists that are curated by Spotify based on your listening habits. That includes sets like the Daily Mix, which feature songs you’ve “hearted” (aka liked) and Discover Weekly, which is designed to help you expand your music taste with artists and tracks you may not be too familiar with. The Release Radar playlist, meanwhile, will let you keep up with all the new music popping up on the service. Spotify says that the more songs you “heart” or “hide,” the smarter its playlists will get and others will begin to populate as a result. The company says its new approach, one that’s not based simply on shuffling tracks (though you can still do that), is intended to keep its more than 90 million free users locked in to the app. A major part of that, of course, is to lure in listeners to its premium tier — and it helps that they can do so seamlessly within the same application. Of the 71 million paid users it has currently, Spotify said, over 60 percent have come from the free product. That’s a huge turnover, and these new features should make that even better. As for the ads, you’ll still have to listen to those with the new personalized playlists, but you may get a video advertisement every now and then that’ll let you jam out without any interruptions for 30 minutes. Ads are annoying, without a doubt, but that’s a small price to pay to get access to some free music. With the overhauled app, one of the things Spotify said it also wanted to focus on was reducing the amount of data people use while they’re streaming. This may not be important for users without mobile data caps, but it’ll come in handy for those who do. As such, the new version of the app comes with a data saver feature that can save you up to 75 percent on mobile data — Spotify says that’s based on a 3G connection. Other than these changes, the Spotify app feels largely the same, with a dark theme and big imagery that makes it easy to browse thorough playlists, artists, albums and podcasts. If you’re a paid user, you likely won’t notice much of a difference, but for those who enjoy the free service those personalized, on-demand playlists are probably going to make them quite happy. Walmart’s latest tech trick is delivering groceries via DoorDash. Except instead of this being a Walmart offering, it’s actually being led by DoorDash according to TechCrunch. End users shouldn’t notice a difference, however. Logging on to the Walmart website, you can place an order, choose delivery and then your bread and produce will show up at your door. And only then will you discover it was DoorDash, not the store itself making the delivery. The pilot program is live in Atlanta currently, with no word on if or when there will be an expansion. In March, Walmart announced that it would begin delivering groceries to 100 new cities this year, up from the six it serviced at the time. Since then, it’s announced partnerships with Postmates, and now, DoorDash, to make that promise a reality. What does DoorDash have to gain? Data, according to our sister publication. The service’s drivers are typically busy later at night, this would give them something to do during non-peak hours. The extra data would then help DoorDash become more efficient and open the door to delivering more than just food. PS4 players don’t have many major choices for battle royale games: there’s Fortnite, of course, but you won’t find PUBG or up-and-coming games like Radical Heights. All that is about to change in a month, though, as Daybreak is releasing H1Z1 (the title that arguably started the battle royale trend) an open PS4 beta on May 22nd. It’ll remain free-to-play with purchasable cosmetic items, but will pack new progression mechanics to keep things quick, including the pacing of the gas (the zone of death in battle royale titles) and airdrops. The team is promising a fast experience, too, with “fully optimized” code that runs at 60FPS if you’re fortunate enough to own a PS4 Pro. In many ways, H1Z1 is effectively the PUBG substitute on the PS4 with a semi-realistic setting and the weapons to match. However, the speed is arguably closer to that of Fortnite. Where a PUBG match can go on for ages if you make it to the final few players (that’s changing with the new Savage map), H1Z1 is designed to wrap up in 15 minutes or less. That might be alluring if you’re more interested in a thrill ride than the slow-building tension that tends to define the battle royale genre. Over the past 28 years, the Hubble Space Telescope has inspired a generation of astronomers with insanely dramatic views of the universe, but it’s hardly done blowing our minds. NASA has unveiled a new fly-through video of the Lagoon Nebula. Located in the center of the Milky Way, NASA calls it a “raucous star nursery” full of dust and star formation with “Herschel 36,” a star 200,000 times larger than our sun, at its center. 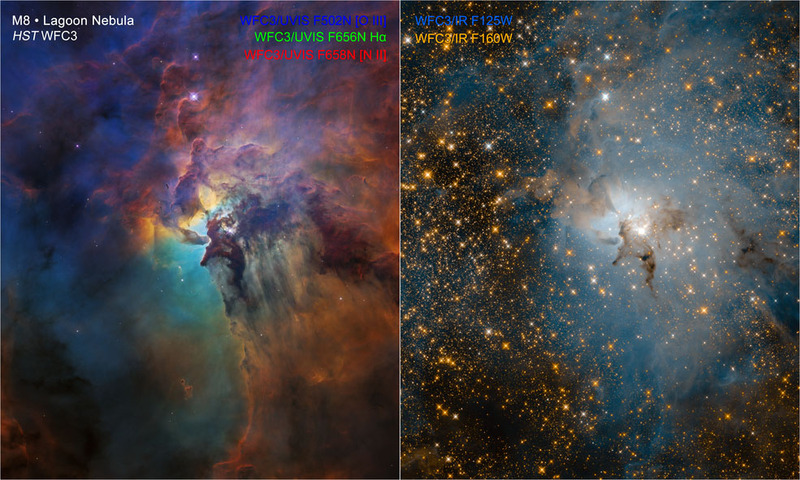 The video starts wide, then zooms in to the center of the Lagoon Nebula, located around 4,000 light years from Earth. Herschel 36 is the most prominent star, emitting powerful radiation and stellar winds that push dust away in “curtain-like sheets,” NASA said. You can see dark, elephant trunk-shaped material that resists the erosion and serves as an incubator for new star formation. NASA employed the Wide Field Camera 3, operating in the visible light range, to create the video. The fourth-generation instrument was only added to Hubble in 2009, and is the space telescope’s highest resolution camera by far. NASA can also flip on a near-infrared channel, which penetrates much of the dust and reveals an incredible number of stars embedded in the Nebula, as shown in the image below. Though public outreach is actually a pretty big part of its mission, Hubble is good for a lot more than just making pretty pictures. It’s been a crucial instrument in exoplanet discovery, for instance, as it recently showed that the Trappist-1 planets may have water by scanning the starlight passing through their atmospheres. It has also discovered new bodies within our own solar system, detected impact sites from the comet Shoemaker-Levy 9 on Jupiter and imaged “deep field” views revealing galaxies billions of light years away, including the farthest ever spotted, GN-z11. It also proved that black holes are common at the center of galaxies, rather than being rare as was thought. Much like the Mars Opportunity rover, Hubble has already flown far, far, beyond its expected mission life, despite getting off to a very bad start with a flawed mirror. Its last servicing mission to install the aforementioned Wide Field Camera 3 was done in 2009 by the Space Shuttle Atlantis crew. Hubble will eventually be replaced by the James Webb Space Telescope (JWST), but NASA recently extended its mission life until at least 2021. Given the recent one-year launch delay for the JWST, it might need to go even longer than that. It’s been tough times if you’re a PUBG player on the Xbox One: while your PC counterparts have been getting a taste of the battle royale game’s third map, you’ve had to make do with just one. Well, that drought ends shortly. The PUBG team is making the desert-themed second map, Miramar, available on the Xbox One test servers. You can download the latest test server release now, with tests running for several hours per day between April 25th (the 26th in Europe) and April 29th. Players who report bugs during these test runs have a chance to score in-game items. Miramar has taken its share of criticism — some players have complained that its open terrain is too sniper-friendly and occasionally barren. However, it still adds some much-needed variety for Xbox One players who’ve become all too familiar with Erangel (as good as it is) since the early access title reached the console in December. This also gives you a better idea of what to expect going forward. The PC version is clearly going to have the lead in terms of features, but that lead might not extend further than it does today. Researchers at Carnegie Mellon University and Disney Research Pittsburgh think we can do more with our walls. In a research paper they’re presenting this week at the ACM CHI Conference on Human Factors in Computing Systems, they present a way to turn all of the static walls that do little more than separate spaces into sensing, interactive, smart pieces of infrastructure. The result of their work is a prototype of Wall++, a wall that can track touch and gestures, sense nearby bodies and their positions as well as detect and locate active appliances. To make the wall — and keep it inexpensive and simple to construct — the researchers tested various conductive paints, the best way to apply them, whether a topcoat was beneficial or a hindrance, how to connect the wall electrodes, the best electrode pattern and how to optimize antenna sensitivity. Following these experiments, the team chose to use water-based nickel paint applied to the wall in a diamond pattern with a roller. They used copper tape to connect the electrodes, vinyl stickers as insulation and latex paint as a topcoat. It’s an interesting concept and it could allow walls to take on some useful features. The researchers describe how Wall++ could function has a control panel, allowing users to touch it to turn lights on and off, unlock a door or control music. And it could offer slider-like input, giving more nuanced control over lighting levels, temperature and music volume. The pose tracking feature could be used in conjunction with video games and the appliance activity recognition could, for example, allow for automatic adjustments of lighting and window blind position when a TV is turned on. The work is just a proof-of-concept study and there’s more research to be done in order to optimize it. But it’s a rather simple and relatively low cost setup (as is, it cost just over $21 per square meter) that could introduce some function to our walls. Apple today released a new security update for macOS High Sierra 10.13.4, which comes nearly one month after the first version of macOS High Sierra 10.13.4 was released to the public. The new macOS High Sierra security update can be downloaded directly from the Mac App Store or through the Software Update function in the Mac App Store on all compatible Macs that are already running macOS High Sierra. According to Apple’s release notes, Security Update 2018-001 is recommended for all users and is meant to improve the security of macOS. The update addresses two security vulnerabilities related to Crash Reporter and LinkPresentation, both of which could be used maliciously to gain access to a Mac. A Safari 11.1 update is also included, with fixes for WebKit vulnerabilities. Additional information on what’s included in the security update can be found in the accompanying support document.